Fifteen typical examples of the versatile brush of Emil Carlsen are on exhibition in the Macbeth Galleries, 450 Fifth Avenue, through March 15. The range of subjects and treatment give a good idea of the versatility of the painter, and delicacy, feeling and charm characterize each canvas. Some of the works are familiar, but the majority are recent and strong presentments of nature, realistic and poetical. “Ripening Corn” is luminous, and “Heather Hills” has fine distance effect and tonal quality. “Study of Surf” is a typical marine, fresh and crisp in color, and “Windham Church” has sympathetic charm. “Hillside Pastures” is lovely in color and full of light and air. At the Macbeth Galleries, Emil Carlsen, N. A., is showing sixteen landscapes and sea pieces, all of them testifying to the honest and appreciative way in which he has studied the world of outdoors. Mr. Carlsen’s admirable paintings of still-life are not represented in this exhibition but the visitor acquainted with his art in this department will find no difficulty in perceiving that Mr. Carlsen studies his landscapes and the surface of the moving sea with a regard as scrupulous in ths search for essentials of form and color as that which he manifests in his studies of fruits and fish, pottery and metal. The pivotal place in the gallery is given to a study of greens, the interior of a wood, with a stream repeating the leaves of overhanging trees. 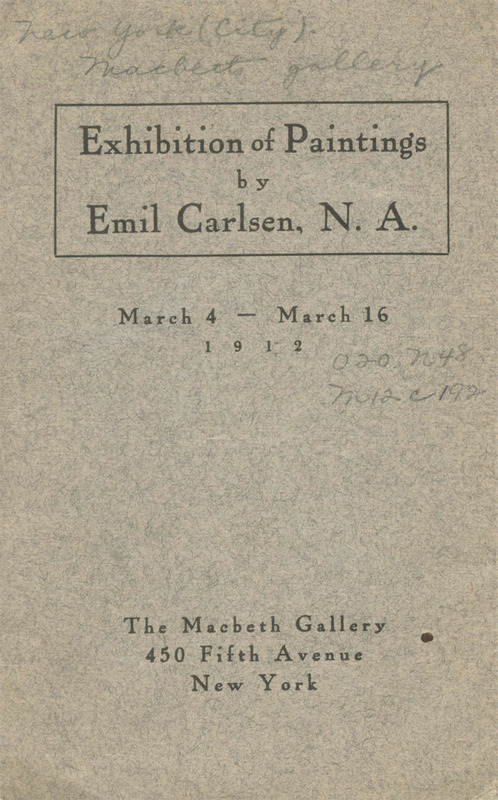 In this, as in most of Mr. Carlsen’s work, one detects the Northern strain in the artist’s lineage, as indicated by a certain hushed quality typically Scandinavian, a quality not precisely defined by calling it restrained, yet suggesting what is calm and quiet as opposed to the vivacity that emanates the art of Southern Europe. Mr. Carlsen is a Dane, but his forty years in this country give the community of artists here a right to claim him as one of them, a right too, that has long ago been gladly exercised. The exhibition of paintings by Emil Carlsen at the Macbeth gallery, show what this artist can do in landscape. Those who are familiar with Mr. Carlsen’s still life will be pleased with the present exhibit. The sense of space and distance in his picture entitled “Summer Clouds,” give his beach the solitary and dreary aspect associated with long sketches of seashore. The boars in the foreground suggest the possibility of human life even in this lonely place. Mr. Carlsen’s version of the sea are familiar to many an exhibition visitor, but his landscapes are aless well known. The mobile waves and clouds of his ocean pictures in the present exhibition give place to firmly rooted forest trees, rocks, hills, and stout-walled buildings. He shows, to be sure a “Sea in August,” in which the deep color marches from green toward purple with strong rather than delicate gradations, and not so much the effect of light as of color; and there is a study of surf and a cascade that misses the look of a downward rush of water. The “October Beachwoods” and the “Pool in the Forest,” each case evokes the spirit of the woodland without however, suggesting the stir of wing amoung the branches or the tremor of the leafage in contrast with the immobility of the trunks and the solid earth. The “Shadow of the Cliff” is a pale rather cold, picture, not precisely empty, as the notation of the shadow value is in itself interest enough, but large without spaciousness. We liked much better “The Old Sycamore,” a delightful study of tree form, and a fine composition of color, with the grizzled trunck and green foliage against a hot and somewhat murky blue sky. Ripening corn also is truly “blonde comme les bles” and “Hillside Pastures” is closely observed. 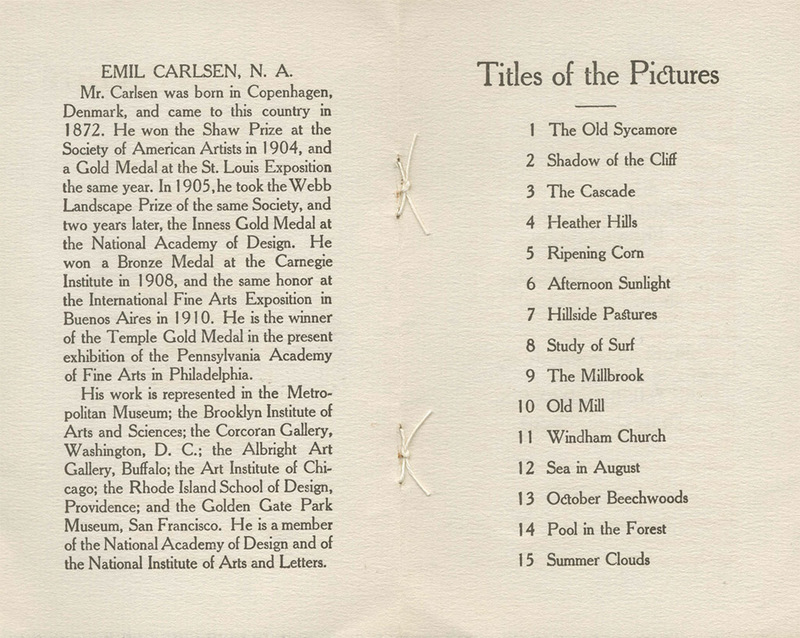 Mr. Carlsen seems not quite at home on land, but if we think of his pictures as decoration without asking for portraiture we invariably get something beautiful and considered with a certain precious quality that captures the larger canvases more fully than the smaller, contrary to common experience. The exhibition lasts until March 16. Emil Carlsen is certainly a poet with his brush, a many of distinctly original ? and an accomplished craftsman. Some fifteen canvases shown at the Macbeth galleries, 450 Fifth avenue, disclose all these qualities and more, for before the pictures one realizes that the man has exquisite taste in the matter of design. Here surely is nature seen through a temperament. Here is a naively personal viewpoint, backed by consummate power to express the visualized ?, according to Arthur Hoeber. it is all tender, appealing, refined, and full of sentiment. A great glade in the forest is expressed with delicacy and no little power; several views of the sea and rocks are rendered with the most agreeable color, and there are some ? of hills with trees, generally in ? about…?